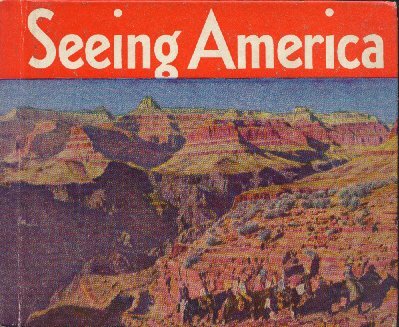 "1937 - Hard Back Book - Seeing America - Published by Rand McNally. " (854) 1937 - Hard Back Book - Seeing America - Published by Rand McNally. -Condition: Excellent A fascinating look at America through photos and descriptions from the 1930's. This book has 64 pages, with each page showing 2 photos of famous sites with a paragraph of description for each photo. The photos are in B&W. There is a map drawn at the beginning pinpointing each place mentioned in the book. There seems to be at least one famous site for each state (48) and areas of Canada. The cover is tight and all of the pages are secure. They are in excellent condition. The book measures 7" by 5 1/2". Price: $8.00 + shipping.